Dean Tomás Guilarte meets with congressional offices on the heels of President Donald J. Trump’s budget request; FIU Intelligence Fellows travel to D.C.; Dean R. Alexander Acosta confirmation hearing rescheduled. As President Donald J. Trump unveiled his fiscal 2018 preliminary budget request, Tomás Guilarte, dean of FIU’s Robert Stempel College of Public Health and Social Work, spent Thursday afternoon on Capitol Hill advocating for the protection of critical research dollars from the National Institute of Minority Health and Health Disparities. Guilarte met with the dean of the Florida delegation, Congresswoman Ileana Ros-Lehtinen, offices of the Florida delegation, and other Congressional champions for health disparity research such as Senator Thad Cochran (MS) and Ben Cardin (MD). “Today’s meetings were a great opportunity to underline the importance of maintaining research funding related to minority health disparities and other public and social health problems. I am very appreciative for the support of our congressional delegation, and in particular, the face-to-face meeting with Congresswoman Ros-Lethinen,” Guilarte said. The president’s budget request is the first step of many in funding the federal government and, although Congress will ultimately appropriate dollars, the budget request serves as a blueprint for lawmakers as they negotiate funding levels. President Trump’s budget provides for a significant increase in defense spending, raising the level by $54 billion. To offset these increases, Trump proposes cuts across the federal government. Some proposed cuts of particular importance to FIU include a 31 percent decrease to the Environmental Protection Agency, a 28 percent decrease to the Department of State, an 18 percent decrease to the Department of Health and Human Services, and a 13 percent decrease to the Department of Education. FIU’s Office of Governmental Relations will continue to monitor any impacts to FIU regarding any proposed budgets and actively promote the university’s federal priorities as Congress negotiates an agreement. The Trump Administration is expected to release a full fiscal 2018 budget request in May 2017. For an in-depth analysis of the fiscal 2018 budget blueprint, click here. As part of a one-year Intelligence Fellowship program, FIU students visited Washington, D.C. to tour intelligence agencies, participate in workshops and meet employers from across the intelligence community. Through the Jack D. Gordon Institute for Public Policy, the program provides selected students the opportunity to integrate rigorous coursework, research and mentorships in pursuit of a career within the intelligence sector. The cohort visited several government agencies including the Central Intelligence Agency, the Federal Bureau of Investigation, and the National Geospatial-Intelligence Agency. The group also participated in a simulation of wargaming strategies with Robert Kurz, a seasoned intelligence expert, and a keynote by Pedro Carvalho, FIU alumnus at the FBI. 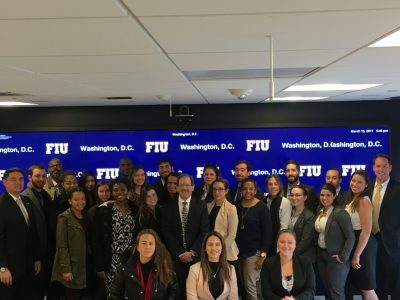 To conclude the program, FIU in D.C. hosted an Intelligence Fellowship Briefing and Networking Reception where students covered topics such as cybersecurity, energy and environmental security, transnational organized crime, and countering violent extremism and terrorism. The fellows will be awarded a Certificate in National Security Studies upon completion of the program. FIU Law School Dean R. Alexander Acosta’s confirmation hearing, originally scheduled for last week, has been moved to Wednesday, March 22. Acosta has sped through a series of milestones: Harvard Law School graduate, member of the National Labor Relations Board, head of the Justice Department’s Civil Rights Division, U.S. attorney in Miami and, most recently, dean of FIU’s law school. If confirmed, Acosta would be the first Hispanic to join President Trump’s executive cabinet. The USHCC holds legislative summit in D.C.
FIU joined its national partner the United States Hispanic Chamber of Commerce (USHCC) at their 2017 Legislative Summit from March 14-16 to convene with various members of Congress and top government officials, recognizing and supporting the importance of small and minority-owned businesses. The Small Business Development Center (SBDC) at FIU is a member of the Florida SBDC Network, a statewide service network funded in part through cooperative agreements with the U.S. Small Business Administration and other private and public partners. The SBDC at FIU has generated $605 million in additional sales, assisted 1,088 business owners at no cost, and created, saved or retained 4,003 jobs in Miami-Dade County. Presenting on a women’s leadership panel was alumna Neri Martinez of the Future Majority Project. The conference also featured several prominent speakers including President Trump, Vice President Mike Pence and Small Business Administrator Linda McMahon. Panthers spotted visiting Washington, D.C.
Facebook: FIU Federal Relations | FIU in Washington, D.C.